The lymphatic system is a network of tissues and organs that help rid the body of toxins, waste and other unwanted materials. The primary lymph organs are the spleen, thymus, tonsils, and adenoids. The lymph nodes filter out bacteria and toxic waste where lymphocytes (white blood cells) attack the bacteria. Why Is Your Lymph So Important? I include lymph cleansing in my 21 Day Detox Program. But I think the lymph is still overlooked. You can detox all day long. But if all those toxins coming out of hiding get stuck in your lymphatic system, you’re going to have a major problem on your hands. I use the analogy that the lymphatic system is like a sewer system of a bunch of tiny toilets all over the body that need to be flushed. Just like a toilet needs to be flushed, your lymphatic system needs to flushed. It’s like a pump. Being sedentary is terrible for lymph. Now that you have that lovely image in your mind of backed up toilets, just imagine what happens in your body if your lymph backs up! Terrible mess that’s what. Because when the lymph backs up, your blood becomes toxic and makes you very sick. Deep breathing stimulates lymph – CRITICAL for pulling toxic waste out because the rib cage is the lymphatic pump. Increase potassium intake – potassium pulls toxins OUT of the cells. Consume an anti-inflammatory alkaline diet – an alkaline diet including organic fresh produce especially leafy greens and avocados flushes lymph. Hydrotherapy – hot cold shower alternation seven times – contracts and relaxes and moves blood which de-congests lymph. Limit animal protein and gluten (which is a protein) – lymph does not drain well in an acidic environment. Too many acidic forming foods are mucus forming, and too much acid waste can damage kidneys. When toxins are not eliminated they have to store somewhere including the skin. Sweat – Skin is often referred to as the third kidney. Sweating reduces the toxic load on lymph system. Lemons (citrus) – are astringents and cause contraction within lymphatic vessels and nodes helping detoxify. Dry brushing – cleans dead cells off skin and moves lymph. Choose organic fruits and veggies – toxins in non organic clog lymph. Do not use antiperspirants – instead eliminate dairy, proteins, and medications that cause odor. Don’t shave all the hair off your body – hair collects and stores toxins and with lack of hair will cause toxins to irritate the skin and toxins will go back into the body. Avoid over eating and avoid mixing foods together – undigested food becomes poison and causes lymph stagnation. Negative emotions are toxic and acidic – clogs lymph – spend time in prayer, forgive, and manage stress. Ultimately if you want to cleanse your lymph and get healthy, you have to change your diet, AND learn how to assist your body in eliminating the toxic waste. The best way to start cleansing your lymph is a comprehensive Detox. Changing your diet is crucial, but learning how to safely eliminate the waste is just as important. 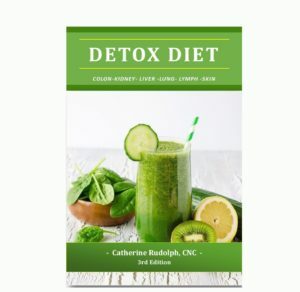 \You can get started today with Catherine’s 21 Day Detoxification Program (eCourse). Detox Diet to Cleanse Your Colon, Kidney, Liver, Lung Lymph and Skin! What is the 21 day detox diet? I am very much interested in any resources that are able to allow me to cleanse while still being sure I can nurse my 7 months old. Have you any info on your site? What can I do about a cleanse. I am diabetic and have significant arthritis. So I have to take some meds. I have terrible swelling when eating bread and other things!?! I travel quite a bit how would the cleanse affect my situation? For best results you will want to allow 21 days where you can make your own meals and not eat out. If you can’t do that, then you would just have to implement the meal plan as much as possible. I am on a plany based diet and I dry brush. How do you know when your lymphatic system is working like ot is supposed to. when you’re healthy and no longer have symptoms of disease. How can a young person recently diagnosed with kidney failure and on Dialysis help their body release swelling, boost organs and restore energy. Appreciate anything in this regard. in that situation you’ll have to ask your doctor since there are so many dietary restrictions with Dialysis. I’ve recently had a lymphatic drainage massage and was told if you don’t pass urine a lot after, then it’s a sign that your system is very sluggish and has a lot of toxins? Is that the case? Also can this also cause constipation? yes it would be a good indication you have toxic overload. And constipation is often where it begins. My Foods That Heal book and videos, or detox would be a great places to get started in your nutrition journey. I’ve been detoxing for the past 2days eating only raw foods, juices and water. If I have a fast metabolism and have been going to the toilet regularly, does that mean that my lymphatic system is already cleansed? You’ll want to base it on the symptoms listed in the article.